There’s this thing called the gender pay gap that’s kind of a bummer for people who care about fair remuneration that isn’t affected by arbitrary factors (I know, right, #controversial). Estimates vary, but the European Commission says there’s a 16% difference between what men and women are paid across the EU, based on the average difference in gross hourly earnings of all employees (so not including things like bonuses). In some fun recent trend bucking, the pay gap in the UK actually increased for full-time workers, up to 15.7% in 2013 from 14.8% in 2012. These are some of the more conservative percentages I’ve seen. Those numbers are a little bit hard to unpick. Sceptics have long pointed out that differences in the ways that women work account for at least some of the gap. So that might be things like fewer women going into the better paid Science, Technology, Engineering or Mathematics (STEM) careers, or women being more likely to have part-time jobs (generally paid lower per hour compared with equivalent full-time jobs) because of taking on the burden of childcare. These are things that are probably life choices for some people but are certainly influenced by a tonne of societal pressures. Even going right back to the kinds of toys children are encouraged to play with, we can see that those chemistry sets for boys and dolls for girls are leading to us ladies haemorrhaging some serious cash. The government’s Think, Act, Report scheme is trying to encourage companies to collect and consider relevant data connected to gender equality, going on to publish information to lead to a national discussion around the gender pay gap and other related problems. That would be awesome. For many companies – especially those in traditionally male-dominated sectors – signing up is a positive first step. We know that at least four choose to publish their gender pay gap, and at least two go further to break it down by grade. I disagree that signing up is all that positive. I mean, it’s promising, but without that evolving into further action, all I can see is a bit of PR for these companies – getting to pretend that they care about equality without, you know, actually doing anything about it. Despite this, they’ve pressed on and published and been forced to start talking about what they’re going to do about it (rather than just continue posting about diversity and inclusion as if they’re all over it). I don’t know if this is something they would ever have done organically. What actually happened is that Tracy Chou, an engineer, wrote about her frustration at the lack of numbers and her experiences indicating that there was a real problem in STEM industries. The report she received for this led to her setting up a Google document for companies to use to share data on the proportion of women they hired; as of 13 August, 174 companies have contributed, some publicly, like Apple, and other anonymously. This shows that only 15% of people hired as engineers by those on the list are women. That means these numbers are actually out there. This is the real first step to challenging gender issues at work. There’s a lot more to do but just having the data to address is exceedingly helpful. There’s a chance for companies to stand up in the UK and offer their data – and the more we hold them to account, the more likely we are that some more of those 200 companies that signed up initially might actually do something. The image is by Justin See and is used under a creative commons licence. 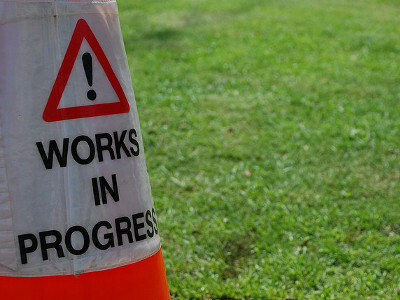 It shows an orange traffic cone to the left of the photo, which has a white sign on it, with an exclamation mark inside a triangle and the words “WORKS IN PROGRESS” on that. The cone is on green grass, which takes up the rest of the photo.